I'm not a watch enthusiast. It's rare that you see me wearing one, maybe twice a month! If I do, I either go for the huge masculane women's watches for daily use(in my case twice a month), or the thin slinky feminine diamond engraved ones for occasions and extravagant outings. My friend asked me what she should get her husband for his birthday and I mentioned an Italian brand watch I have been eyeing for some time now. The U-BOAT. The name is kinda bulky, same as the watch, which I think has the hugest watch face I've ever encountered. Definately not something you would find on a woman's hand. What an eyecatcher! a statement in itself! 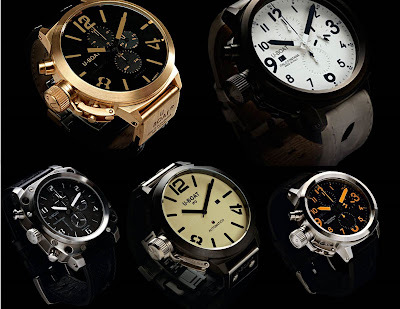 U-BOAT average price ranges around 1000 KD; the priciest (Gold) would be around 8000 KD the cheapest would be around 550 KD. I regret to mention that I don't think it is available in Kuwait.Correct me if I'm wrong. All pieces are designed for scuba diving. Alligator leather straps:( Some come with light in the dark numerals. hi ..just saw ur blog ..really amazing ! good job ..tsadgeen the watches 3jeeben ..o was looking for one ..bs what do u recommend as for both evening and casual ..and good budget ..?!?! this watch has been around 4 a long time..you hve good taste 4 noticing it..!